The First Choice Solder Paste for R&D Labs, PCB Prototyping, Rework & Repair. For nearly twenty years, electronic engineers and PCB technicians have depended on SPE-0012 ZephPaste™ for their high reliability and quality solder joints at their bench tops. Unlike other pastes, the SPE-0012 No Clean Solder Paste is specially formulated for PC Board bench top soldering. 6-months life without refrigeration! Classic 63Sn/37Pb Formulation (the standard solder paste alloy for 60 years in PCB production), the SPE-0012 is filled in popular 10cc syringes. Ships from our factory with cold packs. We insist you get it as fresh as possible. A key attribute is it "stays put" on pads when dispensed with its ZeroBalling™ nature when soldering. Want it lead-free? 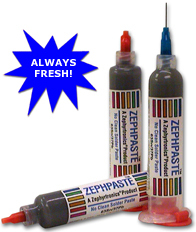 See see our popular ZeroLead RoHS Solder Paste®. Drop In Replacement: The SPE-0012 Solder Paste is a "no-clean" paste with the classic melting point of 361° Fahrenheit or 183° Celsius yielding beautiful, shiny robust solder joints with fillets at the lead/pad interface. Please note that the SPE-0012 makes an excellent drop in replacement for 60Sn/40Pb solders, too. Ameritronics has zero minimum order requirements. Order on-line today. Two 10cc Syringes Each With 12 Grams of Paste. Ships with MSDS. Always Fresh! Six 10cc Syringes Each With 12 Grams of Paste. Ships with MSDS. Always Fresh! Twelve 10cc Syringes Each With 12 Grams of Paste. Ships with MSDS.